Human Nature, have announced they are making a triumphant return home this month with their Little More Love Tour. They will embark on a dazzling national tour that will form a celebration for their loyal fans on the eve of the group’s amazing 30 years of making music together. Fresh from their smash-hit Las Vegas headlining residency – where they have performed in excess of a staggering 1,770 shows – Human Nature’s Toby Allen, Phil Burton, and brothers Andrew and Michael Tierney, will perform a collection of their iconic back catalogue together with instant-hits from their new album, Romance Of The Jukebox. With an impressive 13 studio albums to their name, Human Nature will give fans more than a little bit of love on tour as they go through the hits from their career including ‘Tellin’ Everybody’, ‘Wishes’, ‘Everytime You Cry’ and ‘Last To Know’ through to their work exploring Soul and Motown classics such as ‘Dancing In The Street’, ‘People Get Ready’ and ‘Reach Out (I’ll Be There)’. The group, who first formed in 1989, have continued to sing their way to the top, performing 14 sold-out national tours to date. 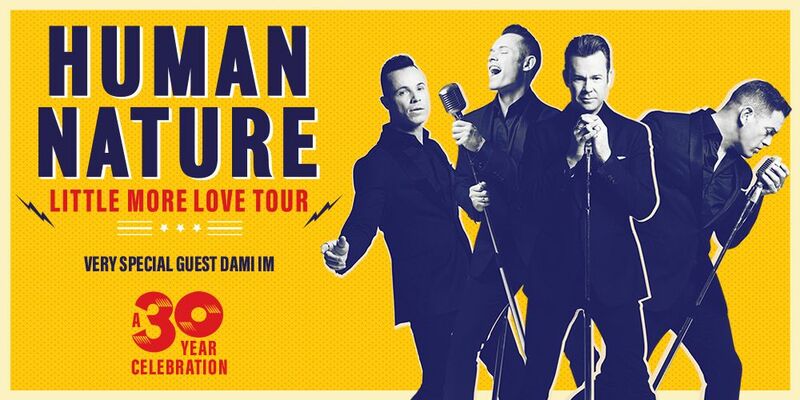 Human Nature will add a further 9 shows across the country with the Little More Love tour in what will be a true celebration of their stunning career.